Oxford, Maine - For many, Super Late Model practice for the 43rd Annual HP Hood Oxford 250 at Oxford Plains Speedway may have been the highlight of Friday's full, action-packed racing card to some, eight divisions of competition were presented to race fans after a full afternoon and more of on-track action leading up to the Sunday, August 28 climax to the biggest one-day event in Super Late Model racing. Matt Williams of Brownfield prevailed in the headline 30-lap main event for the Allen's Coffee Flavored Brandy Street Stock division, posting his second consecutive win in the top support class for the weekly Super Late Model chart-toppers. Williams claimed his second straight victory after getting a late start at competing this year. Williams was chased under the checkered flag by Dan Brown of Peru, with Norway's Jordan Russell following up two straight heat race wins with a third-place main event performance. Calvin Rose, Jr. of Turner kept his title hopes alive, nipping crosstown rival and points leader Matt Dufault for fourth. Before the racing card got underway, well over 40 Pro All Stars Series Super Late Models cranked it up and former track champion TJ Brackett of Buckfield was quickest by a surprising full tenth of a second. Two-time OPS race winner Wayne Helliwell, Jr. and Burnham's Justin Drake filled out the top trio. Scarborough's Garrett Hall, twice a winner in PASS Super Late Model action this season, and Hudson, New Hampshire's Joey Polewarczyk, likewise a repeat PASS ace were next quickest. 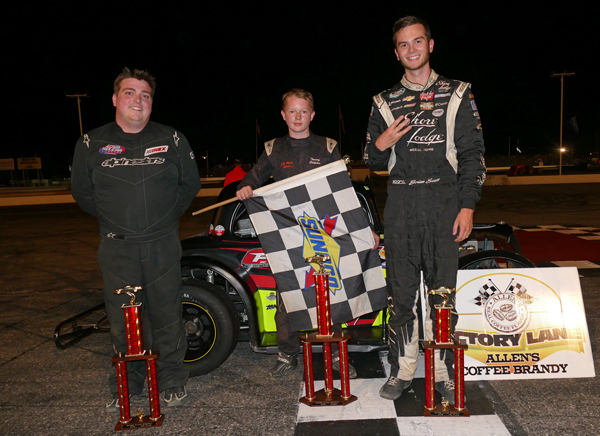 Oxford Plains Speedway Legends Cars points leader Austin Teras of Windham extended his points lead in the battle for the track championship, claiming victory in the 25-lap main event to cement his lead atop the track championship standings for the 13-year-old. Teras patiently awaited his opportunity to pounce, then was followed to the checkered flag by Colby Meserve of Buxton. Westbrook's Jon Peters led for a spell before settling for a third-place finish in front of Nolan Pope of Harrisonville, Missouri, chasing National INEX Legends Cars points. Ryan Doucette of Framingham, Massachusetts rounded out the top five. Waterford's Jamie Heath, the championship points leader in the MacDonald Motors Bandits class, once again outdistanced his chief championship rival, Tyler Green, in the 20-lap finale for the entry-level Budweiser Championship Series class. Heath and Green were chased under the checkered flag by Jacob Hall of Oxford, Dan Wade of New Gloucester and Charlie Hall of Oxford. The three podium finishers also ended up in those same positions as in their previous race. George Haskell of Casco made a late charge up the outside groove to score in the 25-lap headliner for the Wal-Mart Outlaw class, taking the lead away from Windham's Parker Varney, who led most of trhe event's distance. Gary Babineau of Hollis Center and Poland's Ron Moon filled out the top-five rundown. Matt Mahar of Buckfield was dominant in a 20-lap race for the Runnin' Rebel class. Cody Childs of Auburn was best of the rest, with the final trophy claimed by Dustin Salley of Poland. Shaun Hinkley od Oxford and Josh Straitonwere top-five finishers. Auburn's Mikel Martin maintained the lead throughout the 20-lap Cruiser race to claim victory. Runner-up honors were claimed in impressive fashion by Michael McKinney of Berlin, New Hampshire. Phil Knowlton of Oxford, Scott Jordan and Josh Knoll of Mechanic Falls rounded out the top five. Biddeford's Ajay Cates easily outran Matt Curtis to the checkered flag in a 20-lap Sport Truck race. Mark Grantham of Casco filled out the podium. Corey Williams of Sumner and Windham's Kirk Irish rounded out the top five. Maggie Ferland of Poland was the dominant force once again in the 20-lap race for NAPA OAS Ladies division competitors. 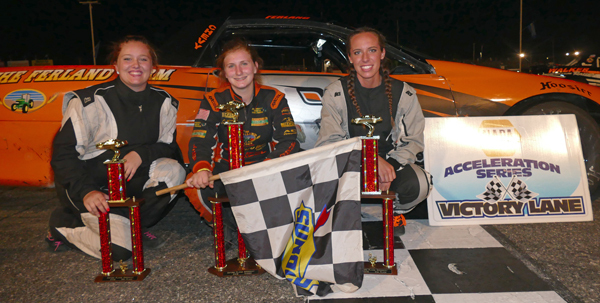 Dixfield's Shelby Shurtleff was the best of the rest by a comfortable margin over a torrid, race-long battle for third position, won by Carleigh Vaughn of Naples over Lisbon racer Breeanna Spaulding. Kathryn Childs of Auburn rounded out the top five. The 43rd Annual HP Hood Oxford 250 weekend continues Saturday, August 27 with the ACT Late Model Tour and the Valenti Modified Racing Series headlining a special 5:00 p.m. racing card. The 43rd Annual HP Hood Oxford 250 Super Late Model classic is scheduled for Sunday, August 28, with qualifying heat races set for 1:30 p.m.
Unofficial Budweiser Championship Series and NAPA Acceleration Series results from Friday, August 26 at Oxford Plains Speedway showing finishing position, car number, driver's name, driver's hometown. Allen's Coffee Flavored Brandy STREET STOCK (30 laps) 1 63 Matt Williams, Brownfield; 2 83 Dan Brown, Peru; 3 4 Jordan Russell, Norway; 4 8 Calvin Rose, Jr., Turner; 5 61 Matt Dufault, Turner; 6 24 Jonathan Emerson, Sabattus; 7 36 Richard Spaulding, Lisbon; 8 0 David Cameron, Alfred; 9 67 Michael Haynes, Livermore Falls; 10 77 Bryce Mains, Naples; 11 23 Zach Emerson, Sabattus; 12 56 Mike Short, Auburn; 13 58 David Whittier, West Poland; 14 06 Craig Coolidge, Auburn; 15 2 Kurt Hewins, Leeds; 16 00 Pat Thorne, Standish; 17 21 Skip Tripp, South Paris. LEGENDS CARS (25 laps) 1 29 Austin Teras, Windham; 2 92 Colby Meserve, Buxton; 3 29x Jon Peters, Westbrook; 4 34 Nolan Pope, Harrisonville, MO; 5 77 Ryan Doucette, Framingham, MA; 6 90 Casey Call, Pembroke, NH; 7 3 Justin Stacey, Hiram; 8 129 Kyle Hewins, Leeds; 9 4 Thomas Everson, Gilmanton, NH; 10 67 Zach Godbout, Mount Vernon; 11 27 Roger Edgecomb, Hiram; 12 18 Parker Varney, Windham; 13 4 Peter Craig, Poland; 14 52 Colby Benjamin, Belmont; 15 7 Kayla King, Buxton; 16 28 Kevin Oliver, Gray. MacDonald Motors of Bridgton BANDITS (20 laps) 1 91 Jamie Heath, Waterford; 2 26 Tyler Green, Turner; 3 5 Jacob Hall, Oxford; 4 37 Dan Wade, New Gloucester; 5 3 Charlie Hall, Oxford; 6 13 Bill Grover, Waterford; 7 4 Caleb Emerson-Mains, New Gloucester; 9 8 Joshua Knoll, Mechanic Falls; 10 05 Gerard Cote, Oxford; 11 18 Brian Hiscock, Turner; 12 79 Jason Cummings, Fryeburg; 13 82 James Record, Oxford; 14 32 Troy Smith, Bridgton; 15 6 Craig Moore, Woodstock; 16 40 Chase Emerson, Turner; 17 56 Adrianna McDaniel, Bridgton; 18 33 Matt Hiscock, Turner; 19 14 Adam O'Neil, Lewiston; 20 26x; 21 1 Brandon Varney, Auburn; 22 90 Ryan Cushman, Temple; 23 19 Chris Foster, Lisbon; 24 29 Tom Harwood, Derry, NH; 25 68 Chris McDaniel, Bridgton; DNS 69 John Childs, Leeds. Wal-Mart Outlaws (25 laps) 1 99 George Haskell, Casco; 2 18 Parker Varney, Windham; 3 1 Andy King, Portland; 4 2 Gary Babineau, Hollis Center; 5 9 Ron Moon, Poland; 6 39 Gerry Freve, Buckfield; 7 53x Jon Brill, Turner; 8 19 Steve Moon, Gray; 9 23 John White, Jr., New Gloucester; 10 74 Rick Thompson, Naples; 11 29 Dynamite Dean Hanscom, Gray; 12 47 Chris Roux, Hollis; 13 03 Bob Wilson, Limington; 14 5 Guy Childs, Sabattus; 15 53 Jason Ricker; 16 8 Keith Stuart, Naples; DQ 09 Mark Turner, Norway. Runnin' Rebels (20 laps) 1 0 Matt Mahar, Buckfield; 2 94 Cody Childs, Auburn; 3 18 Dustin Salley, Poland; 4 2 Shaun Hinkley, Oxford; 5 02 Josh Straiton, South Paris; 6 6 Cody White, Buckfield; 7 11 Jeff Walker, North Waterboro; 8 15 Nathan Dubuc, Lewiston; 9 48 David Luce; 10 52 Mike Nichols, Livermore Falls; 11 44 Rick Montminy, Auburn; 12 08 Jeff Merrill, Roxbury; 13 7 Dylan Luce, Turner; 14 121 Jeremy Farr, Auburn; 15 11x Cam Childs, Leeds; 16 05 Gerard Cote, Oxford; 17 1 Brandon Varney, Oxford; 18 51 Kyle Hewins, Leeds. Cruisers (20 laps) 1 17 Mikel Martin, Auburn; 2 08 Michael McKinney, Berlin, NH; 3 72 Phil Knowlton, Oxford; 4 40 Scott Jordan; 5 8 Josh Knoll, Mechanic Falls; 6 69 John Childs, Leeds; 7 48 Paul Rowe, South Paris; 8 53 Chris Mason; 9 12 Ralph Green; 10 7 Kate Pastore; 11 56 Adrianna McDaniel, Bridgton; 12 4 Will Dunphy, Jr., New Gloucester; 13 68 Chris McDaniel, Bridgton. Sport Trucks (20 laps) 1 2 Ajay Cates, Biddeford; 2 1 Matt Curtis, n/a; 3 07 Mark Grantham, Casco; 5 39 Corey Williams, Sumner; 6 15 Kirk Irish, Windham; 7 22 Jeff Schmidt, Mechanic Falls; 8 3 Alfred McKenna, Rumford; 9 54 Devon Smith, Oxford; 10 4 Will Potter, Windham; 11 51 Ryan Farrar, Oxford. Ladies (20 laps) 1 8 Maggie Ferland, Poland; 2 3 Shelby Shurtleff, Dixfield; 3 34 Carleigh Vaughn, Naples; 4 21 Breeanna Spaulding, Lisbon; 5 17 Kathryn Childs, Auburn; 6 28 Susan Veinott, Greene; 7 47 Taylor Graffam; 8 16 Chloe Kiley; 9 48 Annie Chartier, Mexico.